The issues pertinent to the length distribution of cotton fibers are complex due the combination of factors including a strong genetic component and alterations due to fiber damage in harvesting, ginning and textile processing. As a result, the distributions have complex patterns and exhibit features that often cannot be described adequately using the usual summary statistics. Among the current parameters made available by the existing instruments, the Uniformity Index (or the uniformity ratio) represents the only commonly used shape parameter of the length distribution. Short Fiber Content (SFC) is another parameter used as an indicator of fiber damage, but was found to be inadequate in many contexts. This paper presents an alternative approach to the existing parameters. It defines the distributionâ€™s modality feature as an indicator of fiber damage and of the interaction effects that determine its shape..
A strain sensor was developed by In situ polymerization of pyrrole on elastic yarn through vapour deposition technique. A tosylate as doping agent and Iron(III) Chloride as oxidizing agent were used for the synthesis of polypyrrole. Change in resistance against the linear deformation was characterized and observed that comparatively high conductive samples show poor sensitivity and uniformity against 2% cyclic loading..
ALIBI H1. FAYALA F1. JEMNI A1. ZENG X2. Elastic knitted fabrics are gaining popularity for apparel use due to its improved comfort functional properties. So a lot of researchers are interesting about these structures. In this paper, we presents an artificial neural network (ANN) modeling thermal conductivity of knitted fabrics made from pure yarn viscose (regenerated cellulose) and cotton (cellulose) ﬁbers and plated knitted with elasthane (Lycra) fibers. Yarn count, fabric thickness, knitted fabric structure type, elasthane fiber proportion (%), elasthane yarn linear density, yarn composition, fabric areal density, and gauge, were used as inputs to the ANN model. A virtual leave one out technique allowing the selection of the optimal ANN architecture was used. The generalization ability of the chosen ANN model was calculated. It has revealed a good robustness in prediction with good accuracy. 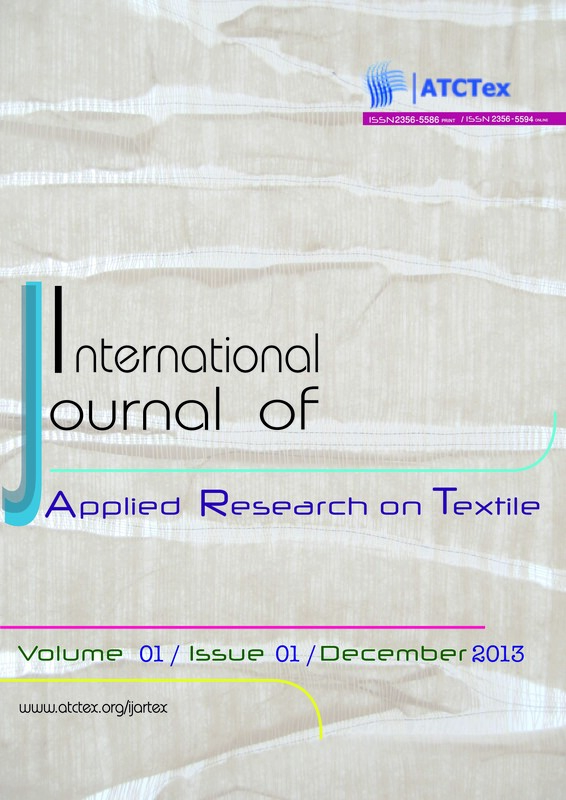 The developed model was able to accurately predict the thermal conductivity of stretch knitted fabrics by selecting the optimum operating parameters and intrinsic features of structure of fabric and yarn..
ABD JELIL R1. ZENG X2. KOEHL L2. PERWUELZ A2. In this paper, artificial neural networks are used to investigate the relationship between plasma processing parameters and woven surface wetting properties. In order to reduce the model complexity, a fuzzy criterion is used to select the most relevant parameters which are taken as inputs of the ANNs. The outputs are the surface water contact angle and the capillarity of woven fabrics. The use of early stopping and Bayesian regularization approaches are considered. Two different network configurations are studied. One deals with two networks having each one output layer and another with a single network combining the two outputs. Obtained results show that the first configuration combined with the Bayesian regularization approach is the most suitable to achieve a good generalization..
1 TEXTILE DEPARTMENT, SABZEVAR BRANCH, ISLAMIC AZAD UNIVERSITY, SABZEVAR, IRAN. Cotton and wool fabrics were treated with single wall and carboxylated single wall carbon nanotubes without using any additional auxillaries by sonicator dyeing.The electrical conductivity of these two kind of natural fabrics were comprised.The morphology of the modified surfaces has been investigated using scanning electron microscopy (SEM). The surface morphology of treated samples was confirming the carbon nanotubes on the surface of cotton and wool samples. With increasing the time of treatment, it was revealed more amount of CNT particles on the surface of the fabrics. Electrical resistance of treated samples was also assessed. According to the results, the electrical resistance of treated cotton and wool fabrics with carbon nanotubes reduced significantly. However, more amounts of CNT observed on the surface of cotton and wool fabrics in the case of using carboxylated single wall carbon nanotubes and is more useful to increase the conductivity. In the short time of treatment cotton fabrics were shown better electrical conductivity and in 45min CNT treatment wool fabrics had higher electrical conductivity..
MAJDOUB M1. CHEVALIER Y2. AZIZI N1. BEN ABDELKADER M1. 1LABORATOIRE DES INTERFACES ET MATERIAUX AVANCES (LIMA), FACULTE DES SCIENCES DE MONASTIR, UNIVERSITE DE MONASTIR, TUNISIA. 2LABORATOIRE D�AUTOMATIQUE ET DE GENIE DES PROCEDES (LAGEP), UNIVERSITE CLAUDE BERNARD LYON 1, UMR CNRS 5007, FRANCE. ABSTRACT New core shell microparticles made of a bio-based epoxy resin wall and having the neroline fragrance as a core material have been investigated for their preparation and properties, and their suitability for cosmetotextile applications has been evaluated. The wall material was made of a polycondensate of a bio-based epoxy-isosorbide prepolymer and methylene bisphenyl-isocyanate produced by interfacial polymerization. The prepolymer was diglycidyl ether of 1,4:3,6-dianhydro-D-sorbitol (DGEDAS) synthesized from isosorbide and epichlorohydrin in the presence of concentrated aqueous NaOH. It was characterized in details by means of chemical analyses by 1H NMR and IR spectroscopy, measurement of the molar mass distribution by size exclusion chromatography and mass spectrometry. Its interfacial polycondensation with methylene bisphenyl-isocyanate led to the formation of the isosorbide-based epoxy-urethane shell monitored by IR and TGA. The core-shell morphology of the microparticles was confirmed using optical microscopy and scanning electron microscopy. The microparticles were deposited onto textile fabrics by an impregnation process using a binding agent. The durability and the perfume release behaviour of the impregnated textile were evaluated through microscopic observations and Thin Layer Chromatography (TLC). .
© All Rights Reserved � 2013 .